State Senator Bo Watson met with nine members of Chattanooga Students Leading Change on Monday, April 2. The students took time out of their spring break to visit Nashville to lobby elected officials to enact common sense gun laws to curb gun violence and improve school safety. Photo by Meghan Mangrum /Times Free Press. This story was updated April 2, 2018, at 11:59 p.m. with more information. Between pauses to take selfies and moments spent staring in awe at old paintings and decades-old rosters, a group of Chattanooga students visited Tennessee's Capitol Monday on a mission — to call on Gov. Bill Haslam and other local representatives to enact stricter gun laws to combat school violence. 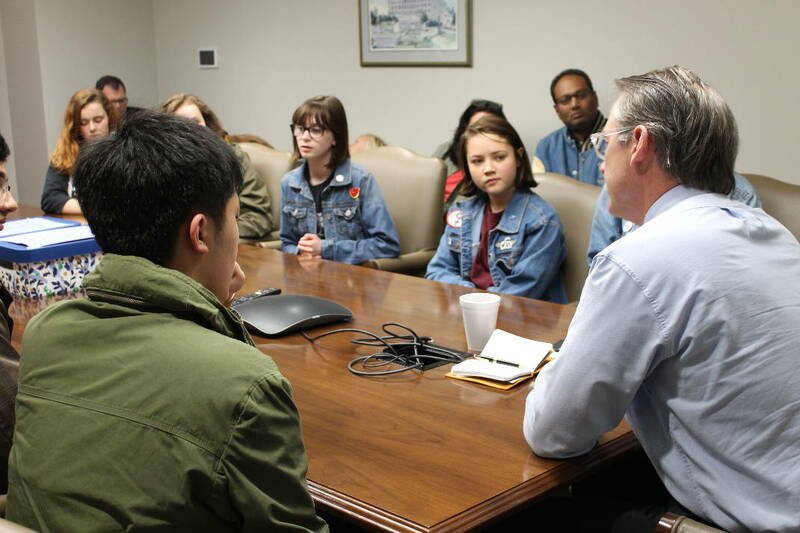 Chattanooga Students Leading Change, the local group of public and private school students from across Hamilton County that planned last month's student walkouts and the local March for Our Lives, met with state Sen. Bo Watson, R-Hixson, and staffers from the governor's office Monday, as well as from the offices of Rep. Gerald McCormick, R- Chattanooga, and Rep. Craig Fitzhugh, D-Ripley. "I'm glad that we are getting a chance as students speaking to adults and them listening, because this is something that really matters to us," said Anika Iqbal, a sophomore at Baylor School. Students are raising money to help cover the cost of their trip to Washington. For more information, visit www.chattanoogaslc.com or contact chattanoogaslc@gmail.com. The student group delivered more than 600 handwritten postcards and letters from Chattanoogans encouraging lawmakers to vote against HB 2208, which aims to allow school districts to arm specifically trained staff members on school campuses, and its sister bill, SB 2563. They urged Haslam to veto the bill, which is on the schedule for the Education Administration and Planning Committee to take up today, if it comes across his desk later this spring. However, the governor was not available and his press secretary did not have a comment. "The goal is to get the message across that we don't want the bill that is proposing to arm teachers to pass and also getting the experience of talking to legislators," said Lauren Tolbert, a junior at the Chattanooga School for Arts and Sciences. "It's important to see how you interact with the representatives and their staffers, getting an idea of how you can interact with them, what you expect them to say back or not to say." In a 45-minute meeting with Watson, the students presented their three-point policy plan that focuses on "awareness, advocacy and accountability" and argues for five policy points: a ban on assault weapons and "bump stocks," universal background checks, creating red flag laws, funding gun violence research and against arming teachers. "We don't think teachers having guns in school will make for a safer environment," said Graham Shults, a sophomore at Chattanooga Center for Creative Arts, citing an incident at Dalton High School last month when a teacher fired a gun in a classroom as a example. "We don't think adding more guns is a solution to this issue." Tolbert said the students are in favor of adding school resource officers — something legislators have made a priority. Last week, Haslam outlined a comprehensive, three-pronged approach for the state to address school safety that includes providing more funding to hire more school resource officers and providing a statewide technology application for anonymous reporting of threats or suspicious activity by students, faculty, staff and others. Haslam's plan came from recommendations from a working group established to ensure schools are safe after the shooting at a Parkland, Fla., high school in February that left 17 dead. Watson said he was encouraged by the students and praised them for their efforts, while also explaining the legislative process and some of the current proposals, such as the statewide reporting application that Haslam proposed last week. "Their view is just as important as anyone else's is to me," Watson said after the meeting. He also urged the students to think about how these issues affect different communities, such as the majority rural areas of the state. "You all come from pretty high-performing schools," he said. "You bring in someone from another part of the state or another school and the conversation will look a lot different." Laura Becker, pastor at Northminister Presbyterian Church and mother of one of the CSLC students, was among clergy members who accompanied the students. Becker, along with two other clergy members — Clay Thomas of Rivermont Presbyterian Church and Brandon Gilvon of First Christian Church — helped facilitate the meetings since the group formed more than a month ago. Becker, speaking for the other adult partners in the movement, called herself a "timekeeper, driver, media scheduler, pizza orderer," saying the kids handle the rest. "I think in some ways, their investment in the future has more weight on it," Becker said. "They are well-versed and know about policy and they have a voice and they know it's powerful." "It's inspirational ... they aren't jaded and they bring a fresh perspective, and that's what youth bring to all of our lives," she added. CSLC planned and hosted the local March for Our Lives event, in which about a thousand people joined hundreds of thousands nationwide calling for an end to gun violence and enactment of what they see as common-sense gun laws. CSLC, which has been meeting nearly every week since the Parkland shooting, has worked with a variety of local groups, including Moms Demand Action and Chattanooga Moms for Social Justice, as community conversations have centered around school safety and how youth are affected by gun violence in Chattanooga. The group has a town hall planned for April 7 that students are calling for elected officials to attend — they have even created a petition calling for their presence. "Federal legislators need to speak with their constituents about gun legislation," said Allen Liu, a senior at The McCallie School. Liu helped organize the letter-writing campaign and was one of five CSLC students who met with staff members for U.S. Sen. Bob Corker, R-Tenn., before the trip to Nashville. The students said they felt hopeful after the meeting with Corker's staff in Chattanooga. They are planning a trip to meet with the senator in Washington, D.C., later this month. "While Senator Corker was not in Chattanooga due to late votes in the Senate, members of our staff were happy to meet with Chattanooga Students Leading Change and hear their ideas and input on a wide range of gun and school safety legislation," said Micah Johnson, spokeswoman for Corker's office, in a statement after the meeting. "As Senator Corker said on the Senate floor, he could not be more optimistic about our country's future because of the impressive young people — like those we met with [today] — who want to leave our country better off than they found it."